Description: I don't think this is General Ceramics Carillon. Any help with the ID would be wonderful. The shape has been copied by other producers (Niloak for one). The clay is an interesting color (see bottom). This piece has a beautiful ring when tapped, almost like crystal. 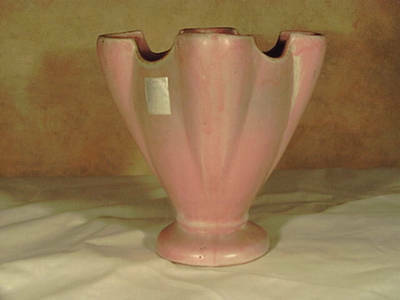 There is a modified version of this vase in blue on this site - click on carillon keyword below. Is is indeed Carillon Ware, but not the same as that sold under the 'Carillon' name produced by General Ceramics subsidiary "Carillon Ceramics Corp."
Your vase was produced in the south - likely KY, NC, GA or TN. Pieces with this label always have the characteristic three-dot base on clay which fired to a light chestnut color. They almost always resemble Niloak (in fact, I've never seen what I'd call a truly original shape or glaze from Carillon Ware). I have to think there's a strong Niloak tie-in. Perhaps Carillon was produced by a potter who trained or worked at Niloak. Thank you. If I see the three dots again, I'll know what I'm looking at. The discusson board I participate in has had several discussion on look-a-likes. I'll add this one to the mix. My opinion (based upon nothing) is that Gen. Ceramics had a china line of art pottery (Carillon bell-logo) and a much rarer pottery line named Carillon Ware. 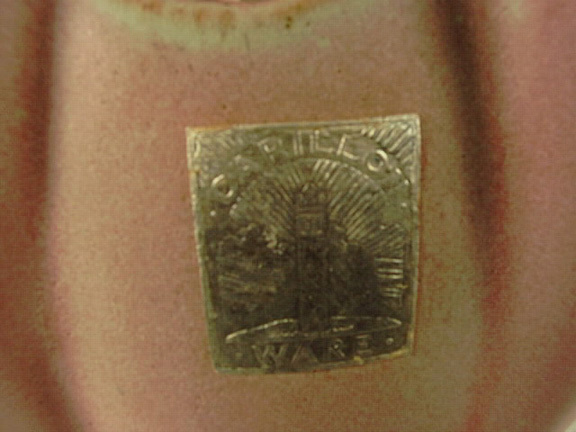 Mention of Carillon is made in David E. Gifford's guide to Niloak pottery. I suspect there was a mold maker who traveled from pottery co. to co., or who made molds for sale to pottery cos. There is a tie-in with castware at Van Briggle too. These potters were a mobile group of gypsies in search of the perfect place.